PGI Visual Fortran (PVF) fully integrates the PGI suite of high-performance 64-bit and 32-bit parallel Fortran compilers and tools from The Portland Group into Microsoft Visual Studio 2005. PVF features the latest version of PGI's native OpenMP and auto-parallel Fortran compilers. PGI compilers are supported on and can generate fully optimized code for a broad range of popular high-performance computing platforms including 64-bit x64 and 32-bit x86 processor-based systems. PGI Fortran compilers offer world-class performance and features including auto-parallelization, support for multi-core processors, OpenMP 2.5, and the the PGI Unified Binary™, The PGI Unified Binary streamlines cross-platform support by combining into a single executable file code optimized for both x64 processor families. State-of-the-art compiler technologies found in PVF include vectorization, parallelization, interprocedural analysis, memory heirarchy optimization, function inlining (including library functions), CPU-specific optimizations and more. PVF includes features to enable rapid code development. The Fortran aware text editor supports syntax coloring, Fortran intrinsics tips and keyword completion. PVF also automatically manages all build dependencies. PVF is interoperable with Microsoft Visual C++ so Fortran sub-programs can call C functions and vice versa. PVF includes a number of DVF/CVF compatibility features including full support for the Win32 API. Sample projects include building Fortran dialog boxes, console and Windows applications, DLLs and static libraries. PVF augments the Visual Studio debugger with a custom debug engine that provides the language-specific debugging capability required for Fortran. The PVF debug engine supports graphical symbolic debugging of single-thread, multi-thread, and OpenMP applications. It enables debugging of 64-bit or 32-bit applications symbolically using source code or with interleaved assembly code, and it provides full access to the registers and hardware state of the processor. The PVF debug engine is interoperable with the Visual C++. Documentation includes the PVF User's Guide, PVF Release & Installation Notes and the PGI Fortran Language Reference Manual. Extensive online help for PVF is built into the Visual Studio help system. The PVF User's Guide and PGI Fortran Reference are also part of PVF online help. PGI Visual Fortran is available in two configurations. PVF Workstation Complete includes a bundled copy of the Microsoft Visual Studio 2005 IDE†—the premier Integrated Development Environment for the Windows platform, the current MSDN* documentation library, assembly-optimized BLAS/LAPACK/FFT math library routines, PGI's PGPROF® parallel performance profiler, and a full boxed media kit with CD-ROM's and printed documentation. PVF Worksation Complete has everything you need to start developing Fortran applications in minutes. There is no need to acquire or install any third party software packages. 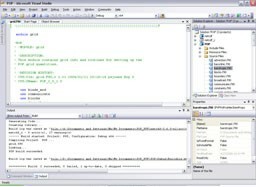 If you already have Visual Studio 2005, PGI Visual Fortran Standard Edition is a complete production-quality parallel Fortran project system "plug-in" for developing optimized Fortran solutions for both Intel and AMD processors. PVF is available in single-seat node-locked licenses. Each license includes both 64-bit and 32-bit compilers. Compiling 64-bit applications requires a 64-bit Windows operating system (e.g. Microsoft Windows Server 2003 x64 Edition or Microsoft Windows XP Professional x64 Edition). * Features available in PVF Workstation Complete only.